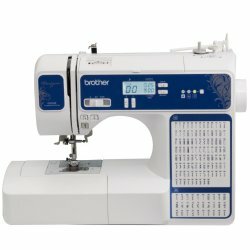 From what may be the best brand in the world of sewing machines, Brother has this terrific computerized model sewing machine. This machine is made for the more advanced users that are going to want to quilt and exercise their creative styles. Its computerized digital display allows you to easily select from some of its great presets, and features. Large Workspace designed for you to have full accsess to your stitching point and is larger than 33% of any other machines workspace that you will find. Which will accommodate your large projects such as formal clothing, costumes, and of course quilting. – Blind Hemstitch to create invisible hems for your sleeves, skirts, and other projects. Do you need a good quilting machine? Read our Best Quilting Sewing Machine Reviews. Stitch selection was so easy with the button selections. This sewing machine is an absolutely terrific machine, with a wide range of features to meet any sewer skill level. It is easy to see why it is one of the best selling sewing machines on the market, and it can be the perfect one for any body that is serious about taking their sewing to the next level!